"...Darlow is a formidably authentic actor, and his flailing gravitas makes for a few extraordinary moments in this piece, but the show never takes hold of your emotions, nor your gag reflexes, as it should and it never sufficiently intensifies. It's hard to play an unlikable man suffering from a condition that engenders only sympathy, but that's the task here. This is a cold-eyed play about the cruelty of aging, and about how the ground is always shifting under our feet. Those realities need more dynamism in their expression." "...t doesn't help that Remy Bumppo's uneventful production seems stuck in first gear. Director Kay Martinovich's cast of top-shelf Chicago actors seems uncharacteristically stiff and untethered. Not much goes on beneath the surface, making for a curiously static evening." "...After all the brouhaha and its crises de coeur, most moving is the final portrait of a grand but broken old man wanting to hear a lullaby and missing his mommy. By this point the tears in David Darlow's eyes are ours too." "...Many people of my generation know the term “Gaslighting”- here is the definition :Gaslighting is a form of psychological manipulation that seeks to sow seeds of doubt in a targeted individual or in members of a targeted group, making them question their own memory, perception, and sanity. (found on Wikipedia). Tonight, as I watched the story being told in the Chicago premiere of “The Father” written by Florian Zeller and translated by Christopher Hampton, this word came to mind. instantly!" "...“The Father” is a pocket-sized lesson in empathy. It is an exploration of what it means to truly love another human being, to be a dutiful family member or to bestow care unto someone who might not remember you in the next day or even the next hour. It is an almost unbearably poignant look into a vintage photograph or a family home video. You may hesitate, as I did, to walk into the theater at all, afraid to relive those hard moments. Rest assured this show, in all its sincerity, will not leave you, just as those you love never truly leave." "...The Remy Bumppo production, skillfully cast and directed by Kay Martinovich, is enhanced by Yu Shibagaki’s elegant set (lit by Brandon Wardell), with its mottled gray walls, large French window and cleverly selected abstract paintings that in their own way suggest a troubled brain. And there is fine music and sound by Christopher Kriz." "...Florian Zeller’s play is a bit of a puzzle. Zeller won the 2014 Molière Award for Best Play. Christoper Hampton translated Zeller’s Le Père into English. THE FATHER debuted on Broadway in 2016 and led to Frank Langella winning a Tony for Best Actor in a play. The show has critical acclaim and global success. Unfortunately, Zeller’s story left me less satisfied." 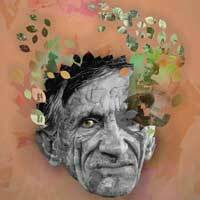 "...The Father by French playwright Florian Zeller is a play about aging and dementia. But it’s not your typical touching human story designed to gain your sympathy for a troubled person and family. It’s a skillfully structured puzzle box that tricks your brain as well as its subject’s." "...Alzheimer's is an insidious disease. It steals dignity as it steals memory, leaving the patient a shell of his past self. Most plays that deal with it focus on the pain it brings to the caregivers, who have to watch their loved ones lose any sense of who they once were. The Father, though it does do that, also is able to allow us into the way that the sufferer views the world. As we watch Andre dissolve from the man he knows he was into little more than a child, Darlow brings home the sheer terror of being in that situation. And as Zeller's inventive script invites us into that experience, we are given a glimpse of what the future might hold either for ourselves or for those we love. It is a remarkable accomplishment, and one of the most important plays you'll ever see." "...The degree to which you, yourself, fear aging will likely determine your view of the characters' progress in this nebulous universe. The actors of the Remy Bumppo ensemble mute all clues with the potential to steer us toward convenient labels, locating the slightest actions firmly in the realm of plausibility to challenge at every moment our choice of whom we extend our sympathies."